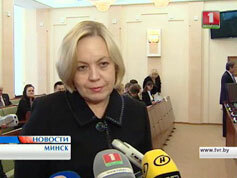 On March 25, Alena Kupchyna, the Belarusian deputy minister of foreign affairs, met with Maira Moira, the European Union’s envoy to Belarus (http://www.mfa.gov.by/press/news_mfa/e9045fcd71ff4ac8.html). The increased frequency of such meetings is caused by the necessity to improve relations in advance of the September 2013 Eastern Partnership (EaP) summit in Vilnius, Lithuania (http://nmnby.eu/news/express/5133.html). Given the current EU travel sanctions against Belarusian officials, the job of determining who to invite to that summit to represent Belarus is like a self-inflicted pain for Brussels. Nobody wants to lose face. The EU is reluctant to suspend the sanctions without the release of the remaining political prisoners. But in the face of tangible economic benefits from Moscow, Minsk is banking on the EU—as the initiator of the upcoming EaP summit—to cave in first in order to salvage the summit. It is in this light that brusque statements by Belarus’s Foreign Minister Vladimir Makei may be perceived. According to Makei, “Some nuances related to the scope of democracy in Belarus are also typical for some other countries that are members of the Council of Europe. But the EU has normal relations with those countries [apparently referring to Azerbaijan, Armenia, Kazakhstan and possibly Russia].” He added, “When we ask our European partners why they are applying one yardstick to us and another to those countries, they explain to us that Belarus is more European than those countries—that is why their approach to us is more rigorous. […] It seems to me this is some modern form of racism. […] Such an approach has no use in international relations and we call it a blatant double standard,” Makei said. Noting the fact that Makei himself is on the EU visa ban list, the Belarusian foreign minister referred to President Tomislav Nikolic of Serbia who was banned from visiting the EU for 15 years and somehow survived. Makei pointed to the absurdities of including judges and journalists in those lists. “Why is it that an opposition journalist who slings mud at the government is a paragon of free speech whereas a journalist from a state-run publication who also expresses his point of view […] is an apologist for the regime and is included in the visa ban list? […] Where is your famed democratic value of free expression?” (http://news.tut.by/politics/341738.html). The journalists not welcome in the EU include Pavel Yakubovich, editor-in-chief of the major daily Belarus Segodnya, and Vadim Gigin, editor of Belaruskaya Dumka, a government periodical. The invoked opposition journalist is Andrzej Poczobut, an ethnic Pole from Grodno and a correspondent for the Warsaw-based newspaper Gazeta Wyborcza. He was accused of defaming the president of Belarus, but on March 14, Poczobut’s case was dismissed by the court (bdg.by/news/politics/21148.html). This, in addition to the permission given to Irina Khalip, the wife of 2010 presidential hopeful Andrei Sannikov, to visit her husband in the United Kingdom as well as her employer in Moscow—despite Khalip’s suspended 2-year jail sentence—are likely the steps that Minsk took to showcase its willingness to meet Brussels halfway. This situation provided fodder for an April Fools’ Day hoax published by Belorusskie Novosti, a news portal giving voice to the opposition. “As Naviny.by learned on April 1,” reads the make-believe report, “a single presidential candidate of the opposition was agreed upon at a clandestine meeting… His name and other characteristics able to cast light on who he might be have not been disclosed. Moreover, the fifth column [this is how Lukashenka refers to the existing opposition] is bent on keeping the candidate’s identity secret until the results of the 2015 elections are announced. […] This strategy will make it more difficult for the authorities to discredit [the opposition candidate] and will magnify his chance for victory. The design is to pique human curiosity. The voters will cast ballots for the invisible candidate just to find out who he is. The candidate will be unmasked only if he wins the election” (http://naviny.by/rubrics/elections/2013/04/01/ic_articles_623_181309/). Although an April Fools’ hoax, it is not far from reality in the sense that uniting the opposition through an open process is unrealistic. Each opposition figure’s major concern is to sideline his or her colleagues so as to receive the undivided attention of the opposition’s financial sponsors. If this is part of reality, it is high time for the EU to face it and resume talking to the actual decision-makers in Minsk. Only by speaking directly with the government can the West return to a position of influence in the Republic of Belarus—unless of course self-deception is preferable.